It was so nice to see the sun again Thursday! Thermometers cooked into the 80s, with pretty high humidity, making for a sweaty summer day. On balance, we have some pretty pleasant weather ahead for Friday and the weekend. But don't let your guard down — Friday evening's thunderstorms look pretty ferocious. We're starting off Friday morning pretty well. It's almost comfortable outside, with temperatures generally in the lower 70s. Some patchy fog developed overnight, especially in valleys and dips and other low-lying areas. I'm not seeing any significantly reduced visibility, so it should not impact your AM commute. Under a mix of sun and clouds, it will be a very warm and humid Friday. High temperatures will end up around 85 to 90 degrees. I suppose the Jersey Shore will end up a bit cooler as a sea breeze picks up, but non barrier island beach will probably still break the 80-degree mark. Pretty good beach weather, if you ask me — ocean water temps are in the 70s, with a cautionary Moderate Risk of rip currents along the Atlantic. The latest model guidance suggests an isolated popup shower or thunderstorm will be possible Monday afternoon. The big storm threat, however, will arrive later. 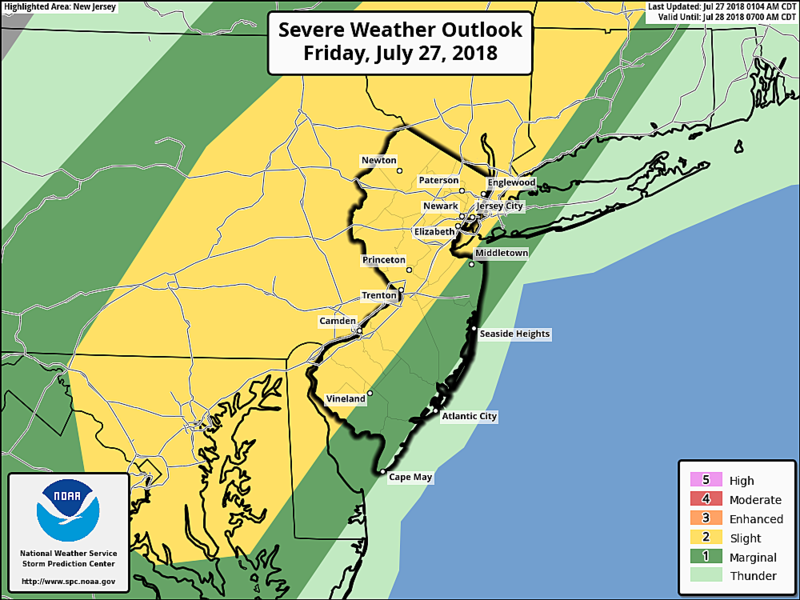 As a cold front approaches New Jersey, the heat and humidity in our atmosphere will help to fuel a pretty healthy line of storms, which will sweep from northwest to southeast across the state. 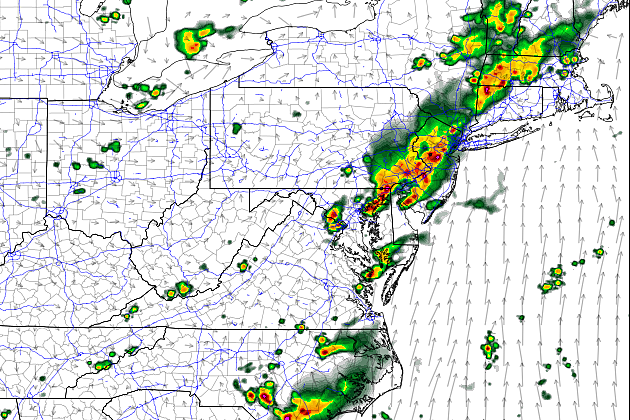 Best guess puts those storms over NW NJ between about 3 p.m. and 5 p.m. and reaching the coast around 8 p.m. to 10 p.m. Most of the night looks stormy (at worst) or damp (at best). One important measure of atmospheric instability (energy) is CAPE — Convective Available Potential Energy. This quantity has to do with the capacity of a parcel of air to rise through the atmosphere if its forced upward. Rising motion is an important mechanism for thunderstorms. The faster and stronger that upward movement, the stronger the storms. The CAPE forecast is pretty impressive for later today, with pockets of 2000-3000 J/kg. That leads me to think that these storms may have a bite to them. Torrential downpours and intense lightning are practically guaranteed. Damaging winds (> 60 mph) and small hail are possible too. The tornado risk is very low (although not zero). Two things will help to kill down these storms: 1.) sunset (which removes the heat energy) and 2.) the Jersey Shore (because of the cooler, more stable marine-influenced air). So thunderstorms should fizzle a bit as the evening presses on. In Thursday's weather blog post, I mentioned the possibility of gloomy weather carrying over to part of the weekend. It's not a sure bet, but I have opted to keep the chance for lingering showers and clouds in the forecast through Saturday morning, especially along the coast. After Noon Saturday, I believe sunshine will take over the sky, with slightly lower humidity too. (Dew points in the 60s, rather than the steamy 70s.) High temperatures will only again reach about 85 to 90 degrees away from the coast. Sunday looks great, from start to finish. The drier air will allow thermometers to dip into the 60s in the morning, and we'll see highs in the seasonable mid 80s. Skies will average partly sunny throughout the day. For next week, we've been monitoring the potential return of unsettled, soggy weather. And that still looks to be the case for most of next week, but I'm actually preferring a dry forecast for Monday at this time. Skies will progress from partly to mostly cloudy, humidity will bump up a notch with a partial on-shore flow, and high temperatures will hold steady in the 80s. Widespread scattered showers and thunderstorms return to the forecast for Tuesday and beyond, but I don't want to wager a wild guest at exactly when and where just yet. Please be smart and stay safe during Friday evening's storms. Have a great weekend!